In 2009, the situation in the confectionary factory of Leaf was very worrisome. Regularly, delivery to the customers was late, there were quality problems, and there was a lot of waste. According to the managers the employees were to blame: they were said to be “incompetent”. However, an entirely new management team, appointed in 2010, proved the opposite! Negative energy was converted into positive energy, by way of Appreciative Inquiry. This method emphasizes the current strengths, and expands those strengths later. The results are astounding: One year after everyone started to work together to achieve a Lean transformation, the factory has already become profitable again. Leaf, located in the city of Turnhout in Belgium, recently merged with the Swedish chocolate manufacturer Cloetta. Famous brands of the Belgian confectionary producer are Redband, Sport Life, Läkerol, Venco and King. However, they also make private label products for drugstore chains. The production process of all confectionary made by Leaf is roughly the same: make a mixture conform the recipe, pour this mixture into a mold to make the correct shapes, dry the confectionary, and finally: make the candies shiny, or add a layer of sugar or acid. This seems simple, until you hear that 250 sorts of confectionary are possible, and that there are in addition gluten-free formulations and the like. As a result a lot can go wrong, in which case waste is produced in Lean manufacturing jargon. This varies from candies landing on the factory floor to whole batches that fail quality tests. Another form of waste is products that are not ready in time, due to machine failures. During each morning inspection, all confectionaries are tasted. In addition, the staff of Leaf tests new products themselves. And, at the end of each month, everyone receives a package of delicacies to take home. You should think that Leaf is a nice company to work for, and that there is reason enough to be proud of the products. However, some years back there were serious problems, which put a damper on job satisfaction. At that time, there was a blame culture in the company. Accusing fingers pointed at the production workers. They were said to be incompetent, and they were even charged of forming a cordon sanitaire against their management! However, something else was going on: That same management had blocked the ability of the production workers to solve their problems themselves. It was clear that something had to change dramatically, or the factory would have to close. 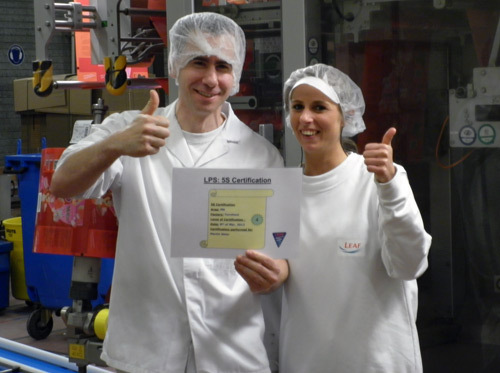 An improvement team receives their 5S certification. This is a method for creating structured and tidy workplaces. To achieve such a Lean transformation, Leaf International appointed a completely new management team in October 2010, consisting of externally recruited people. 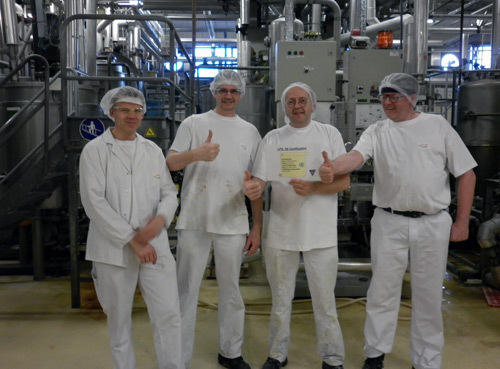 Members of this team are, besides Susanne Peters, a chief maintenance engineer, a quality manager, a supply manager, a plant manager and a HR manager. Only the financial controller was not new. There is plenty of knowledge in the team concerning Lean and change management. Therefore it was decided that adding a Lean consultant was not needed. “We started to define how we would like everyone to deal with each other," says Peters. "The resulting principles we first applied to ourselves. For example, we agreed that we would not hide our problems, but instead bring those up immediately in a respectful way. In fact, we do not even call it problems anymore, but issues or opportunities. Another change was that from now on, the ins and outs of our own departments would be subordinated to the overall result." The goal of the game is manufacturing ships made of Lego bricks. Everyone is given a role, such as operator, logistics manager or customer. In the beginning, the customers complain: the products are of poor quality. The cause of that problem is that the work instructions are not correct. "During the game you learn two things: (1) you are responsible yourself whether you accept losses or not and (2) as a team you can solve problems better then alone, provided that you listen carefully to each other. Regularly we stopped the game for ten minutes, to allow the team to implement improvements. As instructor, it was my task to teach the people to think Lean: First, find the cause of a problem, only then think of a solution”. 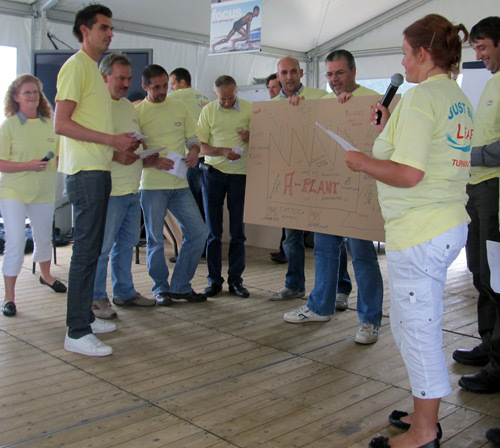 While the Lean training was still in full swing, the management team already began to apply a method called Appreciative Inquiry. "Many improvement methods start to inquire about problems", says Peters. "However, that will get you in a negative mood, and it forces people in a defensive position. We wanted a safe environment for everyone, an environment in which employees are challenged to improve themselves, by contributing to teamwork." To create such an environment, Appreciative Inquiry (AI) uses a different approach. “Without a doubt, there are also things that already go well today. You can built on that by dreaming about an increasingly number of things that also will go well in the future. To this end, we started asking people questions like ‘Where are you proud of?’, and ‘What makes you happy?’. That way we increased their self-respect. This not only generates a lot of positive energy, it also gives people the courage to think about improvements. There turned out to be people who were already working for 25 years for us, but were never praised for something." AI originates from the strengths of an organization, and builds on that. "You can check if it catches on, by asking people to tell stories of events that gave them a lot of energy. In the beginning we got anecdotes of five years in the past, now the stories often relate to things that happened only a few days ago." What also helped was going back to the time things still went well. "The people who were in charge in those days were traced. One of them was even taken back in employment". Another turning point was allowing radios in the factory, upon request by the employees. "Initially they could not believe they could keep those devices." When the culture was ripe for it, the management team initiated the first improvement projects. "Because increasing the reliability of the production process is our main goal, most projects focus on the functioning of machines and production lines. Multidisciplinary teams incrementally improve our productivity. We call it Lean, but you're right when you say that it is mainly Total Productive Maintenance what we do at the moment. Under the heading autonomous maintenance, for example, we involve operators in simple maintenance tasks, like lubrication, inspection and cleaning." The improvement team leaders. Their most important task is to make sure that people collaborate well. 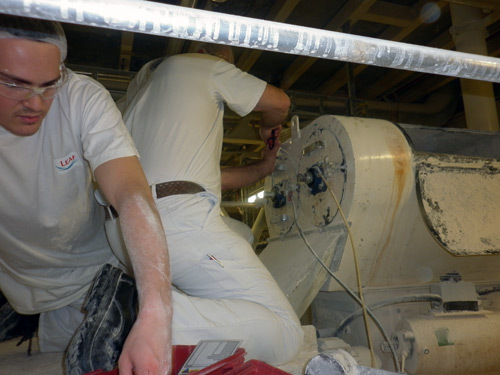 The very first improvement projects concentrated on restoring the basic conditions of the machinery. To this end, the 5S principles were applied to create clean and tidy workplaces, and schedules were made for autonomous maintenance by the operators. "To make time for improvement actions, every Friday one of our two production lines is shut down. This is done under the heading Thank God it's Friday. During each standstill, four or five teams work on their improvement projects. They know what their goal is, but how they want to achieve it we leave entirely to them. That creates a lot of improvement energy. Now that we no longer slow down our employees, they have become very eager to achieve their goals! Successes we celebrate together, for example by eating out." One of the already completed projects is Zero Ground. "The aim of this project was to reduce the amount of products falling on the ground by at least 50%. This results in a better hygiene and less waste. The production floor concerned was divided into eight zones. In each of them the main losses and bottlenecks were identified. Very simple measures like placing trays under crossing points of transport systems already helped a lot. We see this as temporary solution. Ultimately we want to link up our conveyers as linear as possible. This project already saves us 25.000 euro each year. " From the dream day a film was made. It is intriguing to see how the people come in reluctantly, and become increasingly more enthusiastic. In the end, they even form a jigging crowd! During their presentation, one of the teams used the song I got a feeling, that tonight's gonna be a good night. “Later, this inspired us for a mascot, to be used in communications about the Lean transformation process. We choose a candy in the form of a puzzle piece, named Fealy. In that name, all letters of Leaf are included. " The first results of the Lean transformation are already clearly visible. "Our production machinery is now running smoothly and stable. As a result, we are able to keep promises to our customers, and that is the main reason that we are now financially healthy again”. It is often said that it is extremely difficult to implement Lean, However, as shown by Leaf, it is possible to achieve big results within a short time span. In this case it seems that the arrival of a new management team that no longer stood in the way of their production workers, almost automatically lead to greater efficiency! So, becoming Lean needs less guidance than is often thought. The removal of inhibitory (counterproductive) management behavior might be sufficient. "A nice summary”, says Peters. "But, I would like to add that last year we had to put in great efforts to accomplish a change in thinking and doing. However, that generated a lot of energy as well."